SIHH 2015: Introducing the New Richard Mille RM 19-02 Tourbillon Fleur. Live Pictures of a $1.09 Million USD Timepiece. 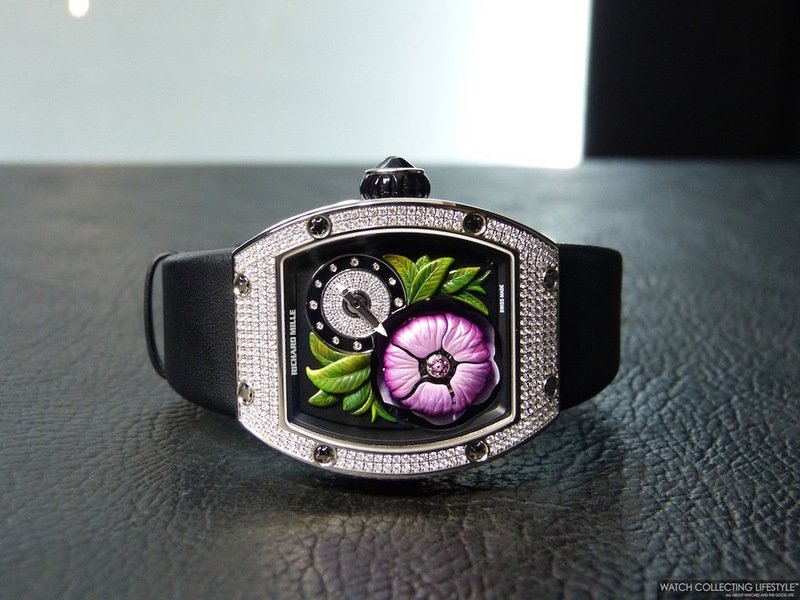 This year at the SIHH 2015 in Geneva, for Richard Mille it was all about the ladies. Richard Mille presented two novelties geared towards ladies and one of them is the Richard Mille RM19-02 Tourbillon 'Fleur' —flower. It was amazing to be able to work on this hands-on review of such an important timepiece. The Tourbillon 'Fleur' is fitted with a robust case in 18K white gold measuring 45.4 L x 38.3 W x 12.55 T, and because of its dimensions this is a watch that could also be worn by a man. The Tourbillon 'Fleur' is available in two different cases. One with a case fully set with micropavé diamonds —as featured on this post— and the other in a red gold case with no diamonds at all. Now, this new Richard Mille RM19-02 is not your average Richard Mille watch. Its dial, holds a precious surprise in lacquer. For the creation of this timepiece a special flower was chosen, the Magnolia. It was chosen as its existence marks millions of years on earth even before bees were around. The magnolia's delicate flowering appearance stands in sharp contrast to its strong organic structure and resilience in difficult environments. On the lower left of the dial, the Richard Mille RM19-02 Tourbillon 'Fleur' incorporates a magnolia wrapped around a flying tourbillon with its five delicate petals. Equipped with a true automaton, the magnolia opens its petals every five minutes —or on demand thanks to a pusher located at 9 o'clock— in a delicate kinetic ballet. To make it even better, the center of the flying tourbillon is set with precious stones to symbolize the stamens of the flower. Fitted with Richard Mille's traditional tripartite tonneau-shaped case, the watch wraps around the wrist with extra comfort and very ergonomically. This sophisticated and classic case construction requires 47 stamping operations, tooling for four hours and a full day for grinding glazing and polishing. The tripartite case is water resistant to 50 meters and assembled tightly by 12 spline screws —Richard Mille's signature case fasteners. Its winding crown shaped as a flower bud is equipped with a torque limiting mechanism that prevents the wearer from overwinding the movement, which could damage the winding stem or put extreme pressure on the mainspring barrel. Powered by the Richard Mille manual wound calibre RM19-02, the calibre is fully visible via the display case back. This calibre is fitted with 40 jewels, flying tourbillon, glucydur balance, jewels set in white gold chatons and which provides a power reserve of 36 hours when fully wound while oscillating at a frequency of 21,600 vph. The watch is fitted with an elegant black leather strap with deployant buckle also set with micropavé diamonds. Knowing that by now, you are wondering what this watch looks like while the magnolia is opening, here's a short video we prepared while at the SIHH 2015 for your viewing pleasure. It is simply stunning and we are confident that you will enjoy it. On the wrist, the watch wears true to its size and quite comfortably. If you are prepared to play with it, remember you have to pay for it. This watch is available in a limited edition of only 30 pieces. Sticker Price $1,090,000 USD for full diamond-set and $970,000 USD for no diamonds. For more info on Richard Mille click here. Posted on January 25, 2015 by Editor & Publisher and filed under Richard Mille, SIHH, SIHH 2015 and tagged Richard Mille RM019-02 Tourbillon Fleur SIHH 2015 Richard Mille RM19-02 Top SIHH 2015 Most Popular.